IMPORTANT DATES – Mark your calendars!!! Our spring clean-up day is scheduled for Saturday, May 1. If you are able to help out, it would be much appreciated. For more information, please contact Cliff. The pool is scheduled to open on Friday, May 21. The hours of operation for 2010 will be 11am-10pm Monday-Friday and 10am-10pm on Saturday and Sunday. Just a reminder that our Fall Cleanup Day at the Pool and Tennis Courts is this Saturday, November 14, beginning at 9:00 a.m. Please join us, as able, to address our Fall project list. Thank you in advance for your willingness to help and to give freely of your time. The improvements to the recreation area are important and will ultimately benefit all of us. The first annual Piedmont Bend chili cook-off fundraiser! WHEN: SATURDAY, SEPTEMBER 26, AT 1:00 P.M. The festivities are sure to fire up the taste buds! 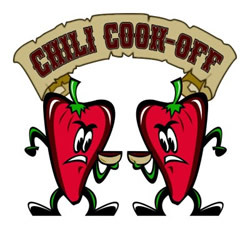 The chili tasting and judging will begin at 1:00 p.m. with an awards ceremony at 4:00 p.m.
Tickets are $5.00 per person or $20.00 for a family. Additional tax-deductible donations are welcome! This event is open to anyone and everyone! Membership in the Piedmont Bend Recreation Association is not necessary. DO YOU THINK YOU HAVE A GREAT CHILI RECIPE? The chili cannot be store bought! Please provide a minimum of 6-8 quarts of chili (this is about the size of a standard Crock Pot or slow cooker). This will assure that we have enough chili for everyone. Chili must be at the pool by 12:00 p.m. There are no entry fees to participate! Please contact Cliff via email cpepper@campbellstone.org or by phone, 404.384.5794, if you would like to enter the competition! If you have paid your dues for the year and no longer have your pool access key, please contact Marty (Martin.Schnurr@comcast.net) to get one.